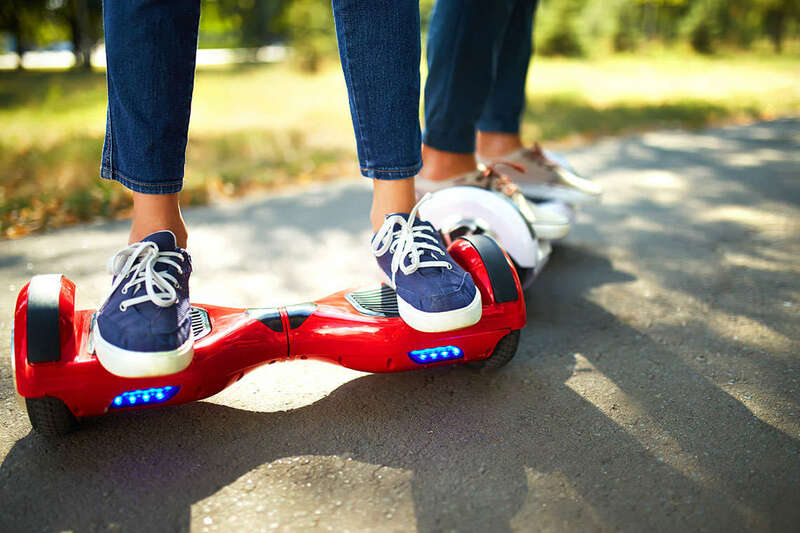 The Hoverboard, a self-balancing electronic scooter, is the hottest holiday gift for 2015: one was sold every 12 seconds on Cyber Monday. Although popular, Hoverboards have come under scrutiny over serious safety concerns. Recent reports about the dangers associated with the device should inform every consumer’s purchase. The U.S. National Association of State Fire Marshals (NASFM), and the National Trading Standards in the United Kingdom have both issued warnings to consumers that Hoverboards could potentially overheat, explode, or catch fire, mainly due to faulty charging mechanisms. If you or someone you know has been injured by a Hoverboard, please contact us today using this form. Our attorneys are currently evaluating cases for individuals that have been injured by these devices. You might be entitled to compensation for medical expenses and other damages. On December 6, 2015, the New York Daily News reported that the likelihood of Hoverboards catching fire or malfunctioning in other ways has become so common that fire marshals in every state were prompted to issue warnings. Representatives from the NASFM claim that explosions are “not a unique occurrence,” and people “need to be vigilant” when considering purchasing an unsafe product for themselves or as a gift. The U.K. organization has seized more than 17,000 Hoverboards since October 2015 and found that 88 percent of them were at risk of overheating, catching fire, or having the lithium ion batteries that power them explode. According to the Daily News piece, the safety issues are likely caused by shoddy manufacturing of the ‘knock-off’ Hoverboards flooding the market. Genuine Hoverboards are made and sold by the company Hover Board Gear, which is based in Carrollton, TX. The devices range in price from $550-$750, with some higher-end models costing as much as $1,800. The high price tags of the genuine Hoverboards have sent some consumers looking for cheaper alternatives, but it is unclear how many devices have malfunctioned and from which manufacturers. Tech toys have been the hottest holiday gifts for years, and consumers tend to go to great lengths to get their hands on them. This year, it is especially important to be a savvy consumer when it comes to purchasing a Hoverboard in order to ensure you won’t be putting yourself or those you love in danger. Don’t Fall into the Trap: Right now, the Internet is filled with ads trying to lure people into buying cheap Hoverboards. Check the source before making a purchase to ensure you are getting the best quality product possible and not a shoddy knock-off. Read Directions: The device should come with detailed instructions on how to use it properly, including how to charge and store it correctly. Proper precautions should be taken, as with any mechanized mode of transportation. Wear Safety Gear: It is important to wear appropriate safety gear, such as helmets, elbow pads, and kneepads, when using the device. Some U.S. municipalities are imposing the same helmet laws for children and adults on Hoverboards that are in place for bicycles, scooters, and skateboards. Consult Local Regulations: Some cities and municipalities have banned the use of Hoverboards on sidewalks and in other areas where they might interfere with pedestrian traffic. Contact the Manufacturer With Questions: If you are unsure about the construction of the Hoverboard you’ve purchased, contact the manufacturer. Ask about quality-control standards, testing protocol and other manufacturing practices if you have concerns about the device. The attorneys at Morgan & Morgan are currently helping victims of Hoverboard malfunctions evaluate their legal options. The firm has extensive experience obtaining compensation for plaintiffs alleging damages caused by faulty consumer products. We encourage you to complete our free, no-obligation form if you feel you have incurred damages caused by a defective Hoverboard.